Produced naturally in the body from L-Lysine and L-Methionine. L-Carnitine is predominantly concentrated in muscle tissue and is necessary for fat metabolism within the muscle. 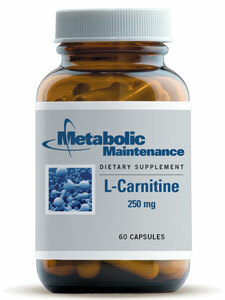 L-Carnitine is crucial in the metabolism of stored body fats. L-Carnitine (as 373 mg. of L-Carnitine Tartrate) 250 mg.